This style of painting that has a subject focus of the temple of Lord Jagannath at Puri, India, is now extinct unfortunately. Hindus have four important pilgrimage spots -known as ‘Chaar Dhaam’ that a devout Hindu ought to visit during his lifetime. The Jagannath temple of Puri is one of them. “Jatripattis” – religious souvenirs of the kind that were given to the pilgrims who visited Jagannath temple until the start of the century (1900s). The old methods of painting have now been discontinued. These pieces are estimated to be from the late 19th century or earlier. While pattachitra is drawn on tussar cloth, the authentic jatri patti is created on a particular type of variety of mat that is made of natural fibres and stone-polished. Before painting the coarse cloth is treated with glue and then painted upon cloth using natural colors.It is then treated with lacquer to protect the paint. The vivid colors are characteristic of the historical folk art of the region. . Jatripattis were done by reed pens and had bold lines. The WOVENSOULS.com collection showcases 8 such rare paintings. 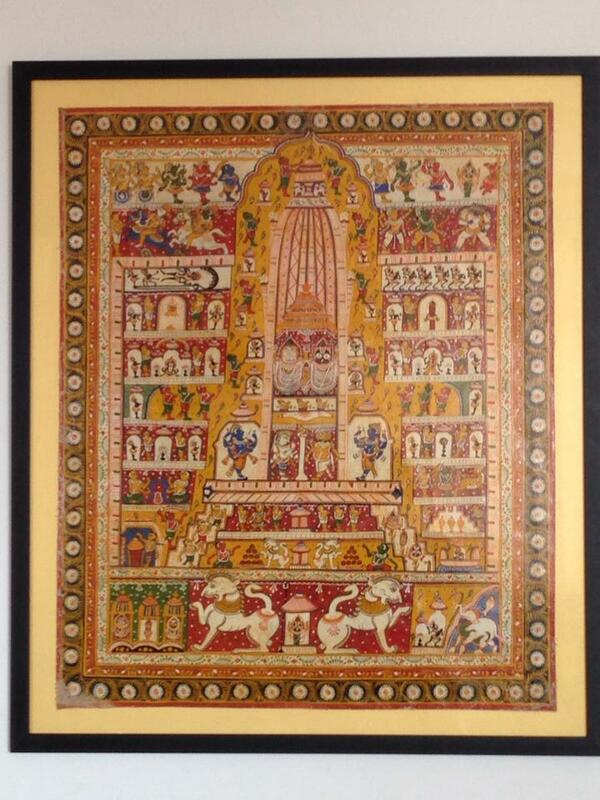 This entry was posted on August 11, 2014 by wovensouls in Art Kaleidoscope and tagged antique art, antique painting, antiques, art, culture, folk art, Indian art, jatripatti, lifestyle, Odisha, old art, Orissa, painting, patta chitra, Pattachitra, pilgrimage, Puri.